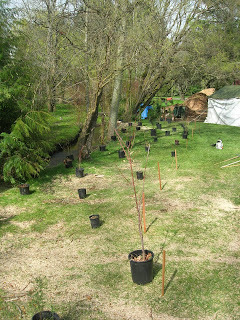 Little Swamp Creek: Tomorrow is Planting Day! The idea of a blog to record the trials, tribulations and wonders of living with a suburban stream has been on my mind for quite a while, and now is the perfect time to FINALLY get the blog started. 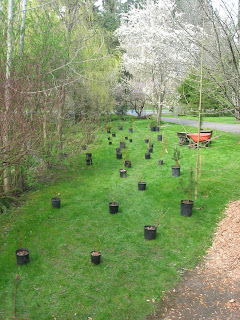 Tomorrow students from The Leaf School at Edmonds Community College (see link on sidebar) are coming in the afternoon to plant native wetland plants and lay mulch along the eastern side of the portion of Little Swamp Creek that runs through our yard. The amazing Adopt-a-Stream Foundation are who we must thank for the plants, the mulch, and the coordination of the much appreciated LABOR!! 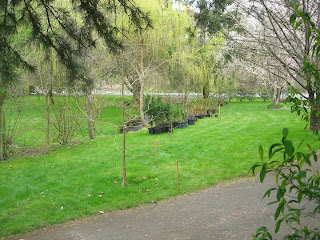 That is a great picture of all of the plants that are going to be planted tomorrow along the east side of the stream. 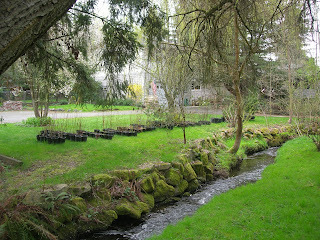 One of my goals for this blog is to record the evolution of this restored riparian zone along the creek. So here's the starting point! 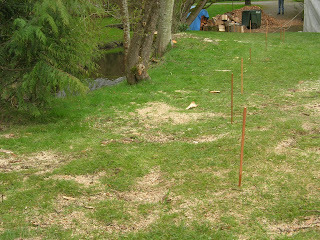 Later this year the plan is to re-grade (I don't think that's the proper term - more on that later) and plant the western side of the stream, which may be even more exciting to record and share. 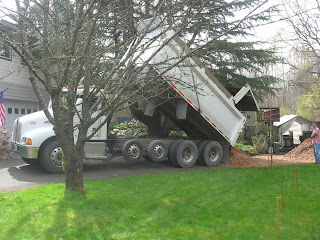 One of two loads of mulch being delivered today. 45 cubic yards all together. Whew!